Gallstones - cholelithiasis from year to year is diagnosed among the population, and in the United States it annually affects about a million of people. The number of people struggling with gallstones is on the rise, and women suffer even two times more often than men and in this article we will try to give you more great advice from phytotherapists for natural treatment of gallstones, as well as advices on nutrition and diet. Symptoms of gallstones know how to be very well hidden and quite difficult to detect, which is definitely a disadvantage for their diagnosis. It often happens that we do not known we have gallstones as it may be a while before the first symptoms manifest or else their presence becomes haphazard - most often it is revealed with an ultrasound of abdomen. Sometimes the gallstones are so small that they are seamlessly removed from the body, although they can reach the diameter of 2.5 cm and make big problems. While gallstones are suspended, the patient has no symptoms, but when they run and get stuck in the bile duct, they cause very severe pain (biliary colic) under the right ribs, which are spread in the back, shoulder and right shoulder blade, sometimes expand in the chest, causing fear of a heart attack. It often occurs with nausea vomiting, wherein upon expulsion of stomach contents the relief does not happen. If the movement of stones is associated with inflammation (inflammation of the gallbladder) it may cause an increase in body temperature accompanied with fever. It happens that gallstones completely close the bile duct and thus prevent the discharge of bile into the intestine and causes jaundice. Symptoms of attacks last from a few minutes to a few hours or even several days. While gallstones can form at any age, even in babies and young children, the most common are gallstones which occur between the ages of 30 and 60 years. It is believed that the main reason behind the emergence of this problem is excessive consumption of foods rich in saturated fats (animal products), which causes obesity and increase in cholesterol levels with increased risk for the formation of stones in the bile. If our liver secretes too much cholesterol because excess bile is created and deposited in the gallbladder and gallstones are formed. Taking hormones and contraceptives, especially during menopause, as well as certain drugs that lower cholesterol also increases the risk, as well as atherosclerosis and diabetes- It is considered that certain digestive problems and digestion can cause gallstones. Improper nutrition is one of the key reasons why gallstones occur, because full attention should be given to the choice of food. Food can decrease or increase the saturation of bile cholesterol - which is the primary factor in the formation of cholelithiasis (cholelithiasis). Some foods may serve as a means of dissolving cholesterol, making it less dangerous. For gall diet it is recommended to eat a toast of wholemeal flour, cooked brown rice, and wheat pasta without eggs. It is allowed to use lean meat, boiled or roasted on the grill, and fish can be eaten low-fat cheeses, olive oil and egg white (yolk can cause contractions). Vegetables are eaten cooked, and fruits in small quantities. Nutrition for gallstones means avoiding fried, fatty meat, full-fat cheeses and foods rich in cholesterol, sugary foods, too cold or hot food and drinks. Not recommended are vegetables rich in cellulose, which, while puffed - cabbage, cucumbers, kohlrabi, onions, cauliflower and beans, fried potatoes and leeks. Also prohibited are pickled vegetables, all types of vinegar, strong tea, coffee, alcoholic beverages and cold drinks. From the you also need to remove paprika, pepper, mustard and mayonnaise from the diet. Rigorous diets are dangerous, because it can exacerbate the problems. With proper diet, every day you take 2 tablespoons of cold-pressed olive oil that will ensure complete emptying and cleaning of the liver and gallbladder, and reduce the ability to form gallstones. When suddenly interrupted by administration of fat, then the gallbladder has often insufficient contraction that could throw the bile into the small intestine and for starts making new ones. Also, the problem can be caused by skipping breakfast, as well as making a big break between meals (ideally four hours). 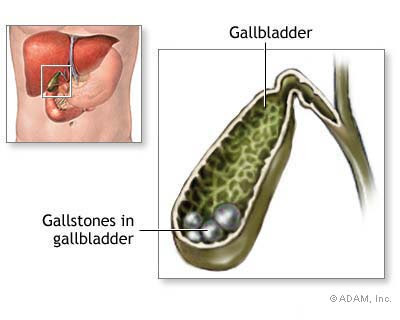 For the treatment of gallstones there are more methods. If gallstones are suspended and do not cause problems, there is no need for the therapy, or confer correction of nutrition and diet gall - reduced fat intake of which have already been discussed. If gallstones are not large, they can be easily removed by ultrasonic waves - breaking stones in the bile, which is carried out with a completely painless method. Stones of cholesterol type in a number of cases are being disposed of non-surgical methods, especially when the gallstones are small, but if they are significantly larger in diameter, usually occurs the removal of the gallbladder with laparoscopic gall bladder surgery or conventional surgery. Mix the juice of onion with honey in the ratio 1: 1, and take 3 times a day one tablespoon, 15 minutes before eating. This tool is an excellent natural remedy for gallstones, it slowly dissolves tiny pebbles. Daily drink a decilitre of freshly squeezed carrot juice or eat a teaspoon of carrot seeds which are previously topped with boiling water and left to stand for half an hour. The treatment lasts for at least a month. The young leaves of horseradish are washed, dried with a napkin and chopped with fingers, and poured into a glass jar and pour brandy so that the foliage is completely covered. Jar is refrigerated for a week, then strained and take one tablespoon of tincture dissolved in a cup of water 3 times a day, half an hour before meals. In severe cases, it is necessary to use 5-6 of these jars. This treatment lasts for 40 days, starting with 1 dl of freshly squeezed juice of raphanus, half an hour before a meal, but the amount gradually increases to 4 dl (this treatment lasts 3 weeks). Thereafter, the amount of juice is gradually reduced until it again reaches 1 dl. Note: This therapy is not recommended if a person has problems with the stomach and intestines. Peel and cut into cubes 2 small beets, pour them with 5 ml of water and cook until the liquid is thick as syrup. Strain and drink the cup 3 times a day before meals. Mix 20 g of anise, ground ivy, hops, mint and wormwood, and 3 tablespoons of the mixture pour in a litre of cold wine from apples and heat to boiling, then remove from heat, cover and leave to stand for the next 5 minutes. Strain and every hour drink one cup. Since liquid should be drunk warm, keep it in a thermos. Mix 40 g of dandelion root and chicory and 20 g of mint, and 3 tablespoons of the mixture pour with half a litre of boiling water and leave it covered to rest for 2 hours. Strain and drink the soup spoon every 2 hours. Pour a tablespoon of chopped horsetail with 3 dl of cold water and leave it covered for an hour and then heat it to boiling and cook 2-3 minutes. Strain and drink 1 dl three times a day. The treatment lasts for at least three weeks. Mix 25 g of yarrow, Celandine, anise, immortelle, mint and senna seeds, and a tablespoon of the mixture pour with 2 dl of boiling water and leave it covered for an hour. Strain and drink 3 times a day, before meals, a cup of freshly prepared tea. The treatment lasts 21 days. Mix 40 g of marigold, 20 g flower cornflowers, 10 g root of nettle, 10 g of dandelion root and 3 g of honeysuckle, and 5 tablespoons of the mixture pour with a litre of boiling water and leave it covered for an hour. Strain and drink 2 dl of tea four to five times a day, only before eating. We recommend that you read the following article: constipation.